Frozen the Musical will open in Summer 2016 in the Hyperion Theater at Disney California Adventure, replacing Aladdin the Musical Spectacular. The last showing for Aladdin will be on January 10, 2016. Be sure to follow along on our Facebook page and join our newsletter for coverage of the final performance. Below is an article from October of 2014 where we reported the rumor that Aladdin would be replaced by Tangled the Musical. Since then we have learned that the Tangled the Musical that was in development was put on the Disney Cruise Line. But, we were correct that the Aladdin show was headed out the door. This announcement of the new Frozen show has left me wondering if the theater will go through any major renovation before the addition of Ana and Elsa. Read the original story for all of our speculation and comments. 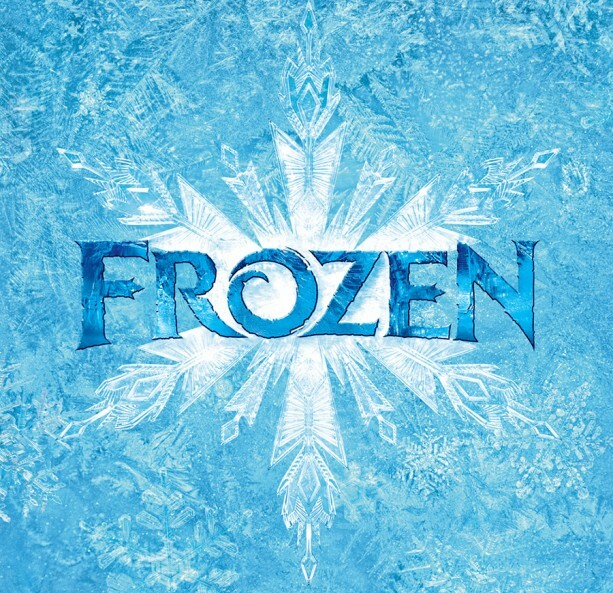 What are your thoughts on the addition of yet another Frozen show? For years, Aladdin the Musical Spectacular inside of Disney California Adventure has been rumored to be closing. Now, we have a likely timeline for the creation and installation of another musical that will take the place of Aladdin when the show ends sometime around the end of 2016 and the beginning of 2017. Disney California Adventure’s Aladdin the Musical Spectacular has been performing for more than 11 years. There is no other show in Disneyland park that has lasted this long save for “Fantasmic!”. Back in 2012, Disney attempted to remove Aladdin to replace the show with Toy Story. After the uproar of the fans, the new Toy Story show was cancelled. The Genie is one of my favorite characters in all of Disneyland. See our post dedicated to the actors who bring this character to life daily in the Aladdin show by clicking here. There are rumblings that Aladdin is on the short list to be replaced sometime in late 2015 or early 2016. This entire project rests on the completion date of Shanghai Disneyland, which is officially scheduled for late 2015 but will probably end up closer to early 2016. This has been confirmed by sources inside management at Disneyland and by the fact that Bob Iger has extended his career as President and CEO until 2018. This is supposedly to make sure Shanghai Disneyland, which is intended to be his crowning jewel, is fully up and running. 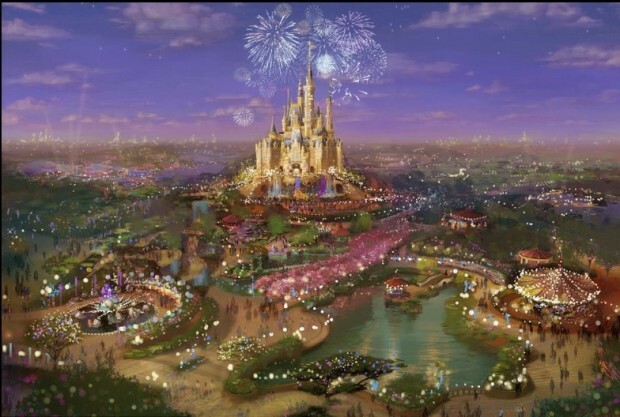 Once Shanghai Disneyland has opened to the public, many of the entertainment producers and Walt Disney Imagineers will once again turn their focus to the stateside parks. Also, the creative budgets will be largely freed up as this huge project comes to a close. With the new production, there could be a full renovation of the Hyperion Theater. This large theater can seat up to 2,000 people. When Disney California Adventure was built, the original plan was for the creation of a large traditional theater lobby with room for restrooms and concessions. One of the goals of this version of the theater was to host large award shows and other functions. While the theater could never become home to the Oscars– Dolby Theater holds more than 3,000 people and has one of the largest stages in the world– many of the smaller industry specific shows would be possible. This of course would be the most extensive possible plan and I don’t see a renovation this size happening until the rumored Disney California Adventure renovation part 2. In this second phase of renovation, the Imagineers would attack the Hollywoodland Area, re-theming much of the land. A wait and see approach is recommended for this one. Could be a long wait…. There are a couple of possibilities for the new show that will replace Aladdin. Many sources point to the new Tangled the Musical that will be debuting on the Disney Cruise Line. Since 2013, This show will debut onboard the Disney Magic in 2015. Back in 2011 when Toy Story the Musical was announced to be replacing Aladdin, Toy Story was performing aboard the Disney Wonder. The current rumor is that Tangled will debut on the Disney Cruise Line in 2015, enjoy a two year run, and then the show will be enlarged and sent to Disney California Adventure. There is also the recently opened Aladdin show on Broadway in New York. 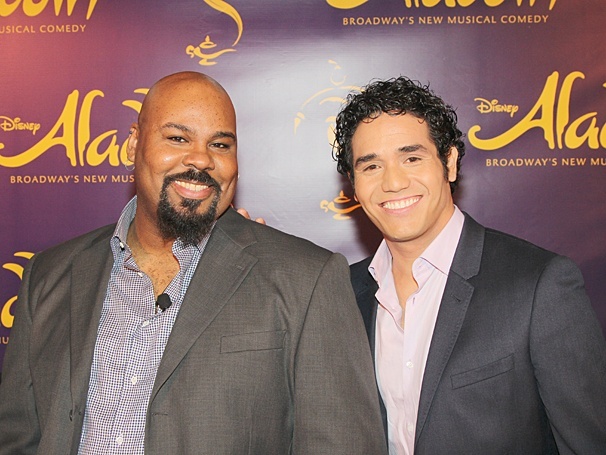 The stars of the show, TONY James Monroe Iglehart and Adam Jacobs, assured me during an interview on the Disney Dose podcast that the Broadway version was quite different than the one found in Disney California Adventure. However, you have to assume Disney Theatrical would prefer to be the only people showing Aladdin. A new cast will debut the show in Tokyo this May and other touring casts are sure to follow. The final piece of this puzzle is Beauty and the Beast– Live on Stage. This show has been running for 23 years in Hollywood Studios at Walt Disney World. So, this one will be a battle. 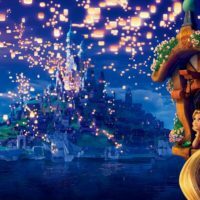 If Tangled the Musical proves to be as successful as expected on the Disney Cruise Line, both Walt Disney World and Disneyland will attempt to move the production to their resort. What do you think of these rumors about Aladdin? I personally have always enjoyed the show even though I have seen it SO MANY TIMES! Are you ready for a switch? Or should Aladdin stick around for another ten years similar to the Beauty and the Beast Show in Orlando? That’s up to the Disneyland Resort and for us to find out. 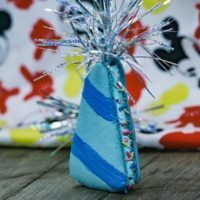 I hope that you enjoyed this news brief, I highly recommend you sign up for the Disney Dose newsletter and our Facebook page for more on the future of Disneyland and fun articles weekly. PLEASE KEEP ALADDIN: A MUSICAL SPECTACULAR ALIVE. It is one of the greatest things in all of Disneyland/California Adventures and I’d hate to see it be replaced with Tangled. Please. Yes C.J. I absolutely love the show as well. Genie is always one of the highlights of my trip. 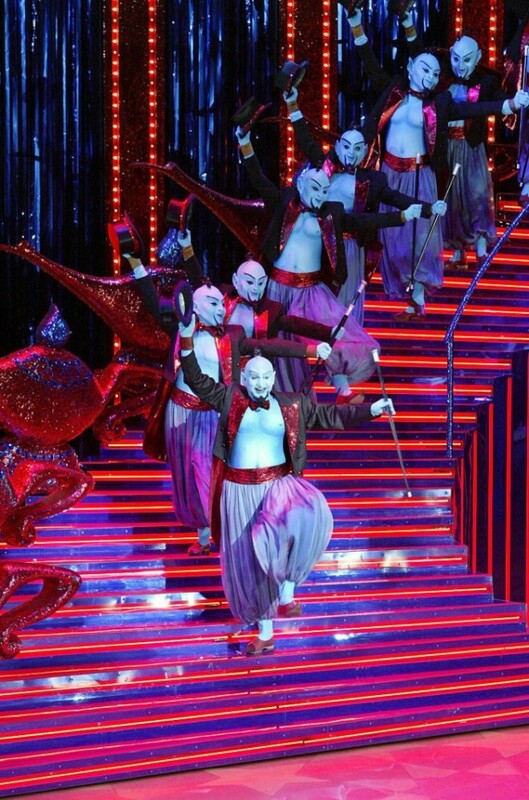 I love the Aladdin show but would be open to seeing something else…interesting thought…. Kind of my thought as well. Anything done with Disney quality is fine with me. Why can’t they share the same theater? Run the shows every other day? Or something along that line. 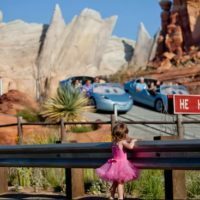 Usually when a new experience comes into play in the parks the marketing efforts revolving around the new concept require the show to run full time. PLEASE KEEP ALADDIN A MUSICAL SPECTACULAR. KEEP IT GOING FOR ANOTHER 10 years! Like the comment below…it is my favorite attractions of Disneyland Parks EVER. I would be so sad to see it go away. It WILL STAY. KEEP ALADDIN A MUSICAL SPECTACULAR PLEASE!!! Let’s keep it for another 10 years. Like the Beauty and the Beast show in Orlando! It would be amazing to see Aladdin stay! It is a show that has such a diverse cast that not many other casts have. Please keep aladdin for another decade or so! This is ridiculous. Enough with Frozen, already! I was recently at D23 and the Frozen fad is wearing thin with hard-core fans. This is an unnecessary change to the park and will not have the staying power of Aladdin. I love Frozen as much as the next guy but I’ve had it with all the park changes, etc. to accommodate it. People are over it. Stop messing with good things that showcase other classic (and much better) movies! No!!!!!! I love Aladdin. Seen it many times, but still see it as many times more as I can! If it’s not broken, don’t fix it. Aladdin is a delight. Frozen has been done and overdone to death, with a glut of frozen merchandise everywhere you look. My guess is the audience will grow very tired very quickly of a ,frozen production in the Hyperionn …..
Bring back Blast! That was awesome. Disney is not always about the newest and greatest films, the movies and shows many of us grew up with are unfortunately fading away and the future generations will never know the beauty that was the old original Disney, the franchise told us to never let your dreams disappear…well they have us our dreams but what they created is now fading…what is left for us to dream about? Aladdin is my dream! KEEP ALADDIN! Absolutely agree Jamie. Thank you for adding your opinion. Please no…..just no on the Frozen. I am a die hard Disney fan and I am so burnt out on the Frozen everything and I’m not even a parent!!!! I can only imagine how they feel. I strongly believe Aladdin deserves a longer run at DCA! The Aladdin show is my favorite show at any Disney Park hands down! This show is beautiful, it creates LIFE at Disneyland. Disney should rethink the permanently removing Aladdin. Aladdin deserves to stay! KEEP ALADDIN: A MUSICAL SPECTACULAR! Nooo!!! Aladdin’s my CHILDHOOD. Frozens ok but the storyline is kinda iffy. Besides the Frozen Fever is dying down, hardly anyone’s buying its merch in the stores anymore. And Tangled wont be as great as Aladdin in my opinion because Aladdins a classic in my opinion. The genie is HILARIOUS he’s the star of DCA, so honestly someone should make a petition to stop the replacement. It is maddening that Disney is getting rid of Aladdin. It is my favorite thing to see when I visit. I often sit by people who have never seen the show and “loved it”. I have grown tired of the same old haunted house and the pirates but the GENIE Is always new. Don’t. Do. It Disney. I would have been open to the possibility of a Tangled musical or a shared space with it and Aladdin, but Frozen is a disappointment! Frozen’s getting the broadway treatment in a few years, anyway, so it can move over and give another story the spotlight in Disneyland. Agreed!!! Watching the genie in Aladdin come up with current events and still sticking to the story line is one of my favorite things to do in DCA!!!! Please keep Aladdin forever!!! Or at least 20 more years!! And when you do replace it, I hope it is going to be with something besides Frozen!! I have mixed fwelings on this one.